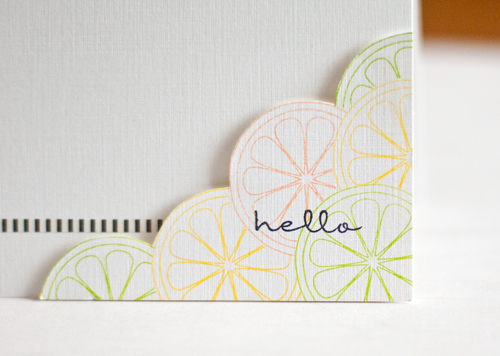 Masked the citrus fruit from Simon Says Stamp You're So Sweet and stamped on white linen card stock. Hand cut and popped up on a card adhered with a strip of Little B Black and White Strip washi tape. It is so narrow and comes on a cute roll with a built in container. And then popped it in the mail! Same day I made it. That's a record. 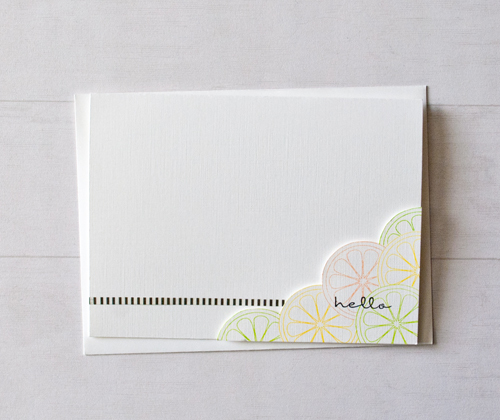 Love that the hello is on the same line as the washi - design perfection! Oh, now this is ultra-cute! I love the look of the linen paper. Brilliant design and so fresh and pretty! Seriously? The very same day? I can guarantee the lucky recipient will have it on her desk for years to come - so very, very beautiful!